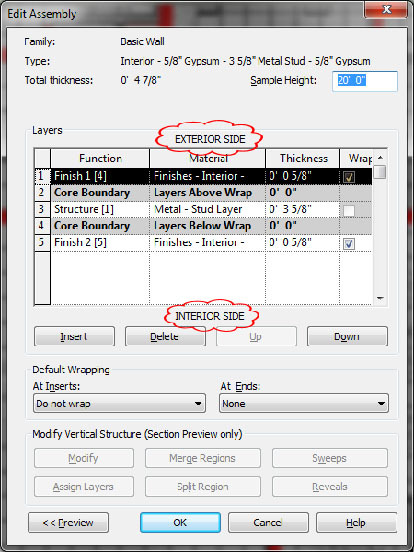 Inevitability when a new user first learns Revit, one of the first challenges they will face is creating a wall type. In most cases a good Revit template file will have all the wall types you should need, but when drawing an existing model, you're bound to run into some different ones. Creating these different wall types can be a little challenging, but most seem to do quite will. The one part that I think gets overlooked when creating new walls types is the fact that the top is Exterior and the bottom is Interior. This is critical to pay attention too. There's also is some confusion on which "Function" to use. The following table describes each function. Supports the remainder of the wall, floor, or roof. Consists of materials such as plywood or gypsum board, which act as a foundation for another layer. Provides insulation and prevents air penetration. Prevents water vapor penetration. The membrane layer should have zero thickness. Used as the exterior layer. Used as the interior layer. Following these simples rules should help anyone create new wall types with ease.